There are several ways to make new plants when growing perennials. This is a guide about propagating perennials. A great way to cut down on the cost of flower gardening is to increase your current stock of perennials using propagation techniques. With only a small amount of time and effort on your part, you can quickly increase your current plants, and who knows, maybe even make a few extra bucks by selling off your extras. Crown division is the easiest method of propagating plants and one that most gardeners are familiar with. If not divided every few years, perennials can quickly become overgrown and enter a state of decline. Crown division accomplishes two things at once. It increases your stock while rejuvenating your remaining plants. Dig up the clumps and use a sharp knife or spade to divide the plants into pieces that contain segments of both roots and shoots. Use this method for: Perennials that grow in clumps like daylilies, Hosta, ornamental grasses, Veronica, Phlox, and Shasta daisies. Cuttings create a new plant by removing a portion of the mother plant and coaxing it to grow a new root system, a new shoot system, or both. This method can be used to propagate shrubs and perennial flowers. Cut off a section of stem 4 inches in length. The stems can either be taken from the tip of a mature plant (tip cuttings), or from new growth at the base of the plant (basal cuttings). Remove all but the top two leaves. Insert the bottom inch of the piece into a rooting hormone and then "plant" it into a pot filled with damp potting soil or a 50:50 mixture of sand and peat. Maintain high humidity by placing the pot in a sealed plastic bag or cover it with a cut-off base of a soda bottle. Place the pot in bright, but not direct, sunlight. Keep it moist (not wet) and check in a month to see if the plant has started to form roots. If the plant resists when you give it a gentle tug it has probably formed roots. You may also notice them coming out of the drainage holes in the bottom of the pot. Use this method for: (Stem cuttings) clematis, dianthus, geranium, lobelia, malva, penstemon, salvia, verbena, and vinca; (Basal cuttings) asters, anthemis, bellflowesr, catmint, chrysanthrmums, dahlias, lupine, monarda, phlox, scabiosa, violas, wormwood, and yarrow. 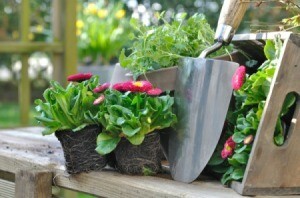 Fill a pot with damp potting soil or a 50:50 mix of sand and peat. Remove a healthy leaf from the parent plant and cut the end that was attached to the plant into a "V". 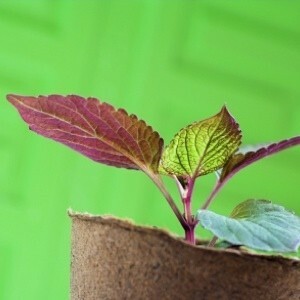 Insert the "V" end of the leaf into the growing medium and cover the pot with a plastic bag or the cut-off base of a soft-drink bottle to maintain humidity. Place in bright light, but not direct sunlight and keep the soil moist. If successful, in a few weeks the original leaf will give way to a new baby plant. Use this method for: Succulent varieties like sedums, sansevierias, begonias, African violets, and jade plants. Note: African violets can also be rooted in water. During the plant's dormant period (usually winter), dig down and remove a pencil-thick portion of root. Try to cut directly across the roots at right angles to avoid disturbing the mother plant. Wash the soil from the roots and cut them into 2-3 inch pieces with a horizontal cut at the top and a slant at the bottom. 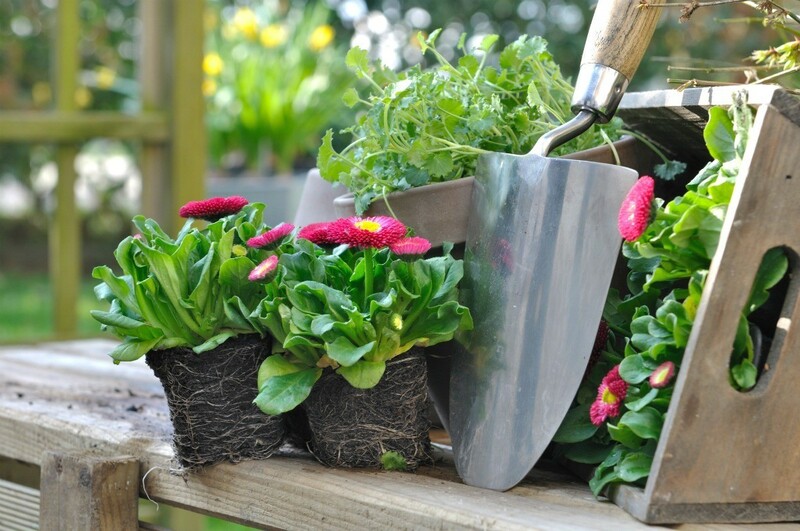 Fill a pot with growing medium (as described above) and insert the cuttings vertically (horizontal ends up) into the pot so that they are just level with the surface. Moisten the soil and cover the top with a fine layer of sand. Set in bright light, but not direct sunlight and keep soil moist (you do not need to cover the pot). Depending on the species you are trying to propagate, expect new shoots to emerge in 4 to 5 weeks. Use this method for: Perennial shrubs and those with thicker roots like baby's breath, bleeding hearts, globe flowers, Japanese anemone, and Oriental poppies. This method allows a new plant to grow while the piece being rooted is still connected to the mother plant. Many perennial shrubs with flexible branches do this naturally. Gently bend the branch of an existing shrub toward the ground. Where the branch meets the ground, make a shallow 1 inch slice in the bark and bury this portion just under the soil. Anchor the branch securely to the ground using a piece of wire (coat hangers work great for this). In a few months the area you sliced will form roots and the newly rooted portion can be cut from the mother plant and transplanted elsewhere in your garden. Use this method for: Shrubs with flexible branches like forsythia, raspberries, blackberries, and hardy roses.